“There, at the top of the mountain, were the wild horses that changed my heart and creative direction forever,” recalls Karen Keene Day. It was the book America’s Last Wild Horses by Hope Ryden that began Day’s journey, leading her to that mountain. As she flipped through the pages of Ryden’s book, the gripping photos and stories of wild horses struck a chord she wasn’t expecting. Day decided she had to write the author and ask her where to find these horses. 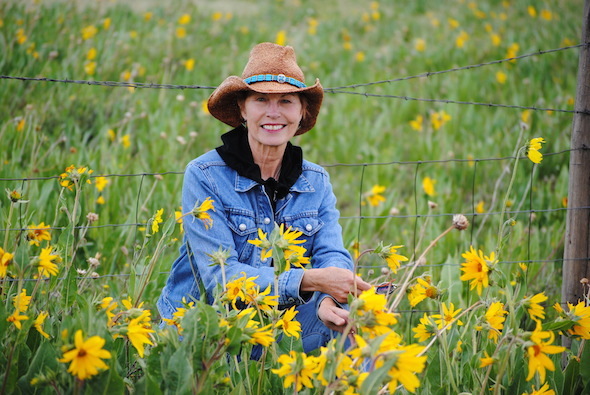 That was in 1997, and by spring of 1999, Day and her husband began making the journey to the border of Montana and Wyoming annually. This pilgrimage of sorts connected Day to these powerful creatures. 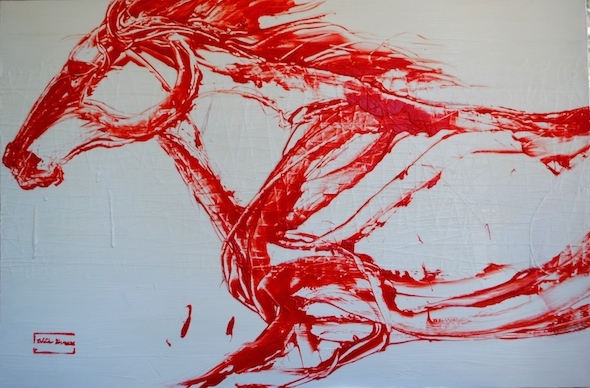 “They moved me, impacted me,” shares Day, and they were the catalyst to her impressive horse paintings. Often referred to as abstracted wildlife paintings, Day uses her pallet knife to capture the energy and spirit of her subjects through acrylic glazes, soft gel gloss, and broad strokes. On the back of her paintings, Day often writes out details about the specific horses she paints. 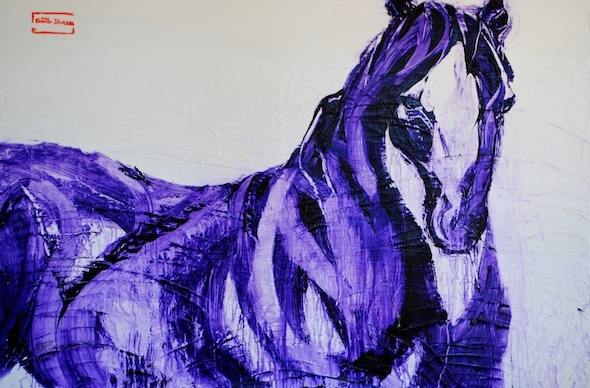 Her newest body of work focuses on Angeni, “a beautiful wild mare who lives in the Sanctuary in Disappointment Valley, along with some of her friends,” Day explains. Entitled Majestic Motion, this new show is a tribute to the unparalleled strength of these majestic creatures running wild and the trials they face out in the open. 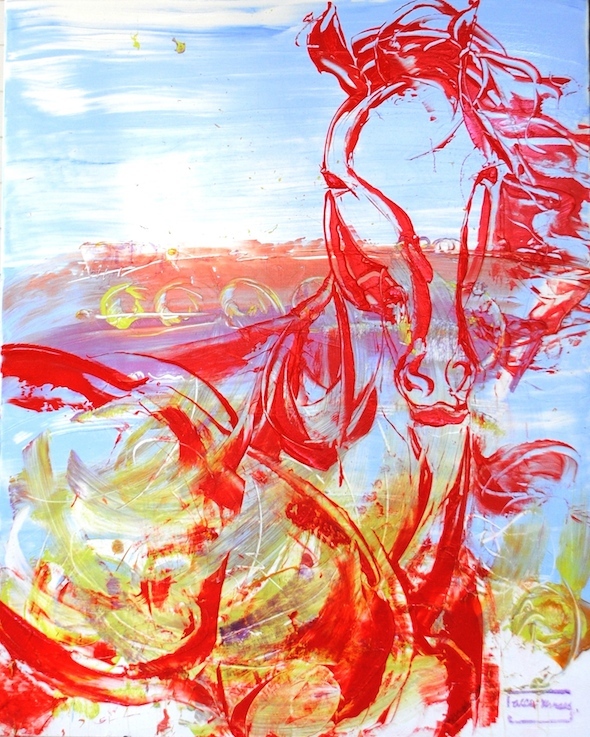 Majestic Motion will feature Karen Keene Day’s newest series of wild horses at Mitchell Hill on March 3 from 6-8pm. 3% of Day’s sales will be donated to the Serengeti Foundation, American Wild Horse Sanctuary. Posted on February 13, 2017 by Matt Mill.